I normally wait until after Thanksgiving to start Christmas decorating, however royal icing decorations may be stored in an airtight container indefinitely. I wanted to give you time to create your royal icing trees. The cake (I chose a Madeira cake) is covered with a thin layer of marzipan and fondant. 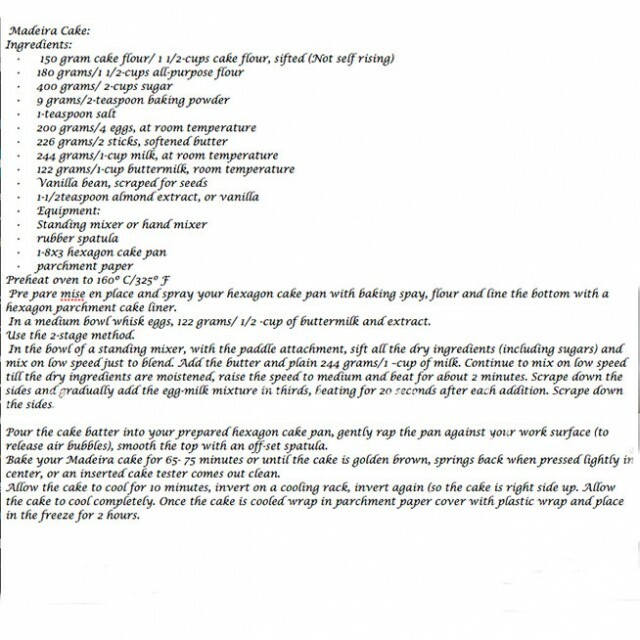 For the shape of the cake I used a hexagon pan and placed the cake on a square cake board covered with fondant. Each tree panel was piped on both sides, if you want a more delicate look pipe only one side (keep in mind the tree will be very fragile). store them for when you are ready to use them. I place bubble wrap over food safe parchment paper to prevent breakage. The filled Trees: Run down run out and run down soft-peak. A 10-inch square cake board covered in fondant and wrapped with a blue ribbon around the edge. Dust your cake with a blue shimmer, and pipe a little round of royal icing balls in groups of three. Add your holly leaves and snowflakes with a drop of royal icing. 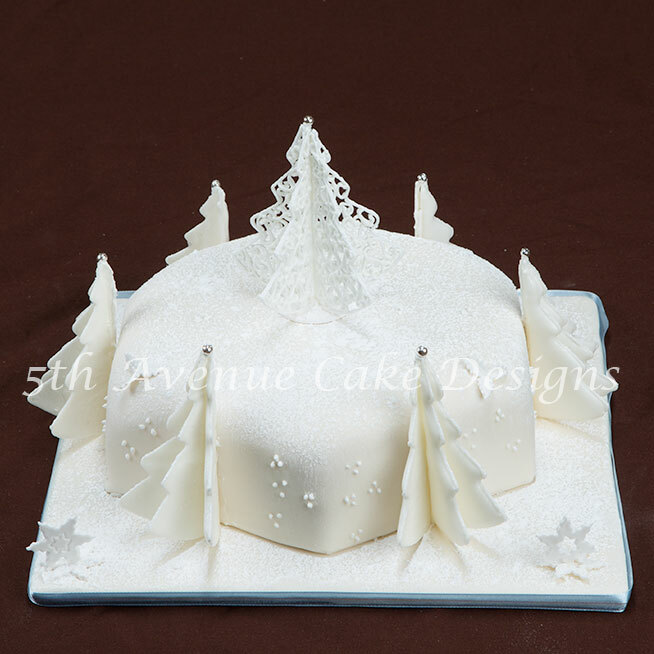 Sift icing sugar over the cake to look like snow. and pipe a thin line of royal icing (off peak consistency ) following the bottom of the tree and GINGERLY attach. Allow to dry for several hours. 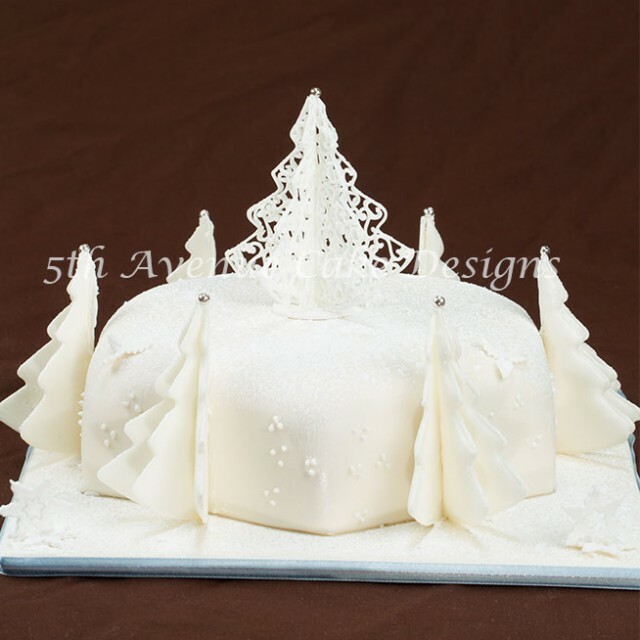 Add the side trees to each side of the cake, starting with one side tree in the middle, and adding two side trees to the middle tree. If you need more trees add one at a time to each side. 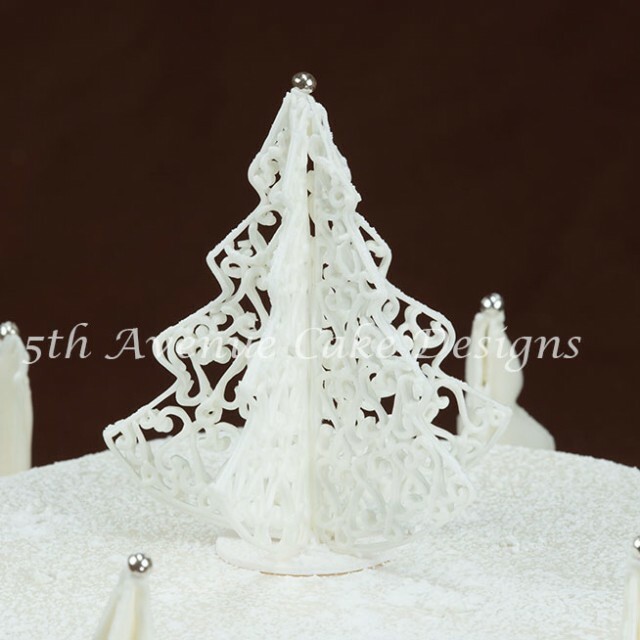 Watch the video below to learn how I created these delicate filigree and royal icing tress. If you watch your icing (not the nozzle) you will be able gauge the pressure and speed needed! Have fun and I would love to see your filigree royal icing art! I am glad you like the cake!